Baby Footprints - what Mother will ever forget the simple preciousness and innocence of her baby's exquisite feet? Each sterling silver pendant on this Mother's Necklace is personalised with a stylised pair of baby footprints and a child's name to go with them. Additional pendants available for more names. A sparkly fine ball chain in your desired length completes a stunning, unique piece of keepsake jewellery. 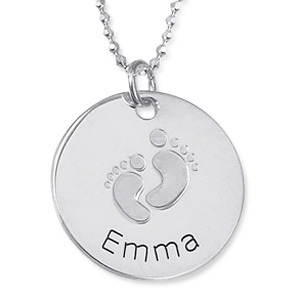 NB: Please note, your personalised Baby Footprints Mother Necklace will be despatched in approx 3 weeks.